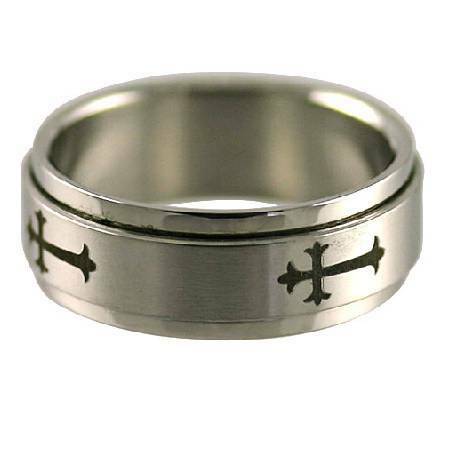 Men's Stainless Steel Spinner Ring with Carved Cross design circling the ring. The rings is 8mm wide. I've had it for a while and it seems to hold pretty sturdy. One of the crosses on it seems to be fading just a tiiiiiiny bit but otherwise it's pretty sturdy! We bought several rings because we couldn't decide which one we liked best. We did love this ring, just a little bit wider than what we wanted, but kept it anyway. It's a beautiful ring and great quality. Love the crosses that go around the entire band. For the price its pretty good, but two of the crosses were misprinted. 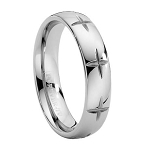 I bought this ring for my 9 year old son. My hope is it will be worn as a purity ring in a few years. I think the quality is excellent and the design unusual. The company ships fast, too. I do think they run a tad small, as I sized this with the online tool as well as a with a ring of known size. This ring fits a little tight by the end of the day, but I do not think it's possible to resize stainless steel.